Illustrate and illuminate your choice of letter with the hugely talented artist and illustrator Janie Pirie. 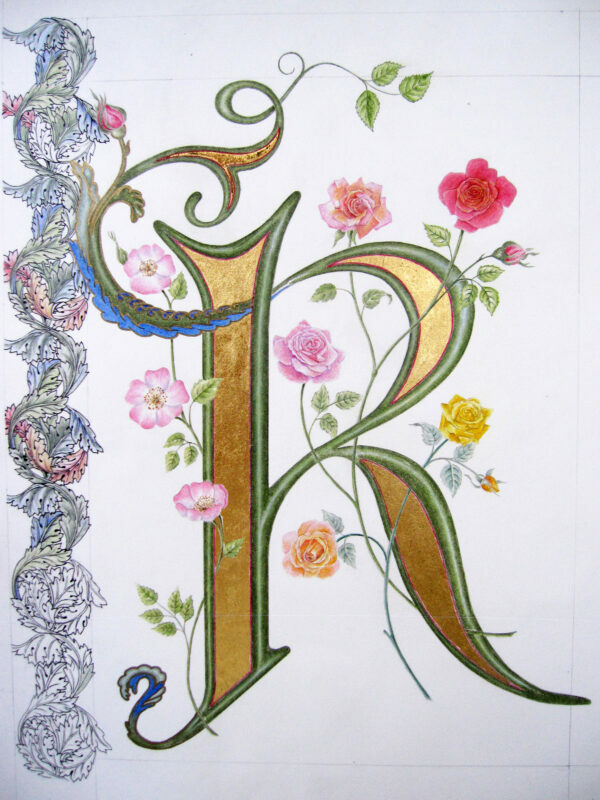 Illuminated lettering goes back centuries and are works of art in their own right. Starting the beginning of a book or chapter these wonderful and detailed letters were designed to illustrate the text that was to follow. Capital letters entwined with flowers, foliage, animals, fairies or abstract patterns and then coloured with vivid watercolours, inks or pencils including gold or silver leaf made them a stimulating and joyous beginning to many an historic volume. Janie will show you how to create your own using coloured pencils. All you have to do is choose a letter you would like to illustrate then create something wonderful. If you have internet access you will find many templates that can be downloaded and traced. However, Janie will have a selection of letter designs for you to choose from on the day if you do not have one already. No piece should be more than 4in. square. Gold and Silver Leaf will be provided. Fineline black ink pen for outlining.